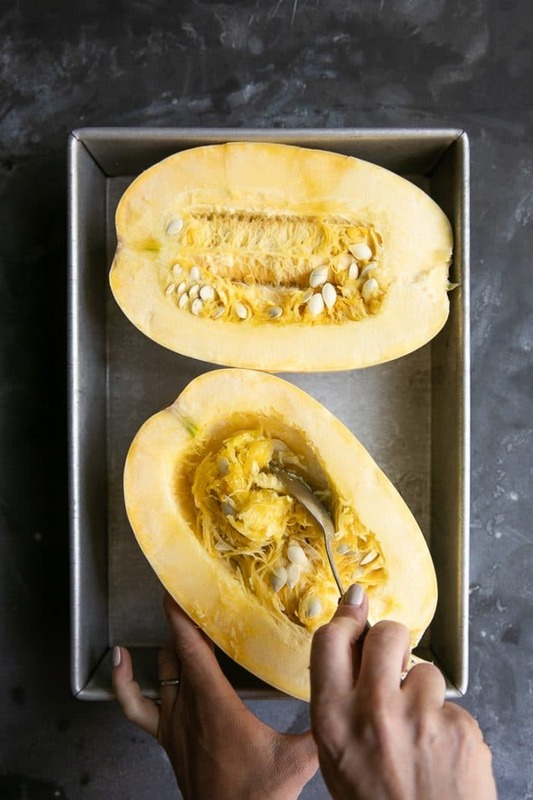 Learning How to Cook Spaghetti Squash may seem intimidating at first, but once you learn these easy methods, tips, and tricks, you’ll be a spaghetti squash pro in no time at all. In this post, I will share how to cut a spaghetti squash, how to pick a spaghetti squash, and how to cook this delicious squash in the oven, microwave, Instant Pot, slow cooker, or boil in a pot of water. Once you look past its tough exterior, spaghetti squash really has quite a lot to offer. 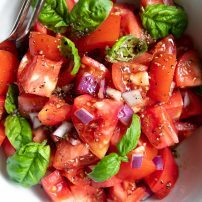 It’s mild in taste and a healthy substitute for pasta noodles and even rice. It is also delicious eaten alone, with a little help from some freshly grated parmesan cheese, or stuffed full of whatever you can imagine. Spaghetti squash comes in a variety of shapes, sizes, and colors, including ivory, yellow and orange. 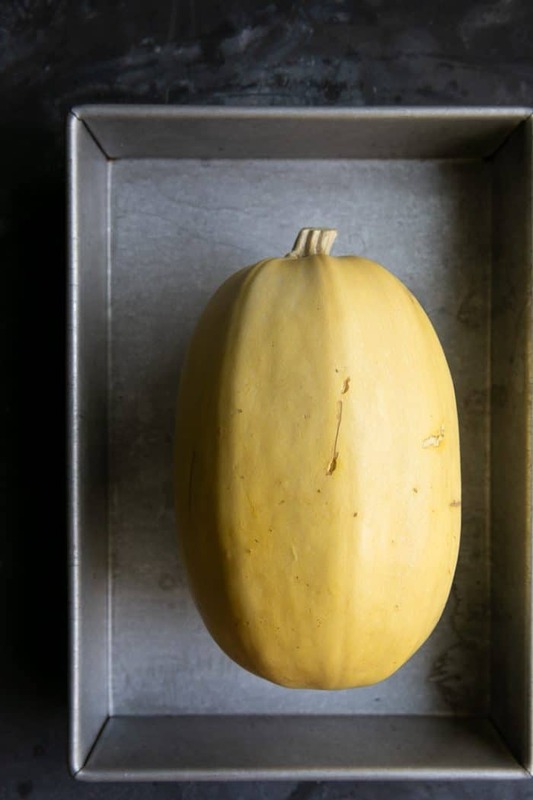 When raw, the flesh of a spaghetti squash is dense and firm; much like that of a butternut squash or acorn squash. It also comes with large seeds similar to that of a pumpkin. When cooked, the flesh turns tender and easily falls away from the skin with a fork into thin, long strands (much like spaghetti noodles). Spaghetti squash is most frequently roasted, but other cooking methods include the microwave, instant pot, or slow cooker. 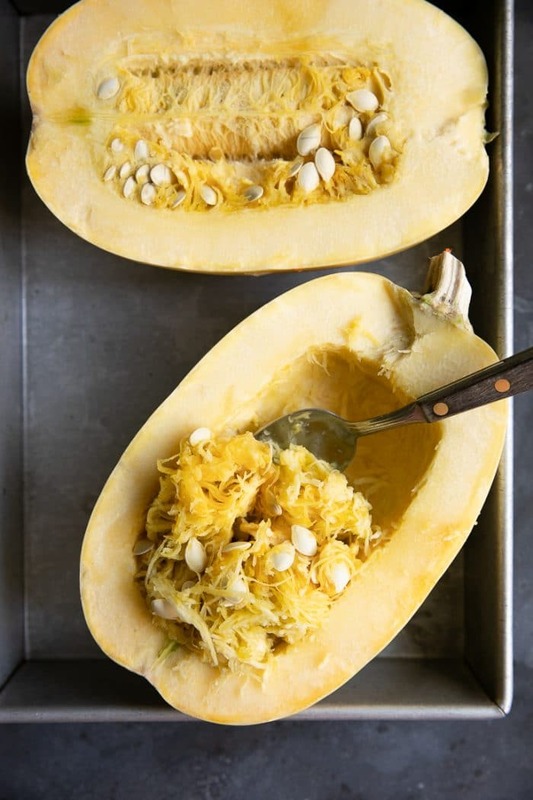 Spaghetti squash is high in Vitamin A, Vitamin C, antioxidants, folic acid, potassium, and beta-carotene. There are approximately 42 calories per 1 cup of spaghetti squash. 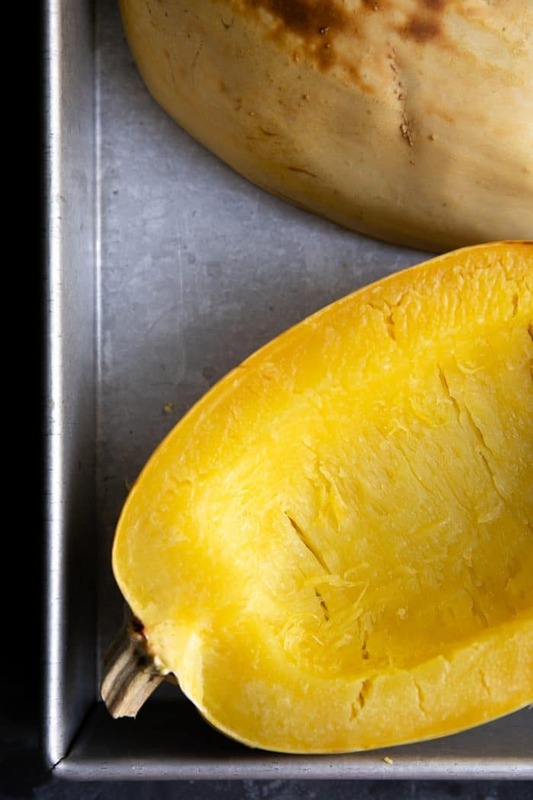 Spaghetti squash is gluten-free, paleo-approved, and overall delicious. Roasting in the oven (2 ways). Slow cooking whole in a crock pot. 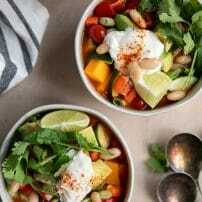 Cooking with pressure using an Instant Pot. In this post, I will cover the pros and cons of each and how to cook spaghetti squash using each method (please note that I have only included images for the roasting method). 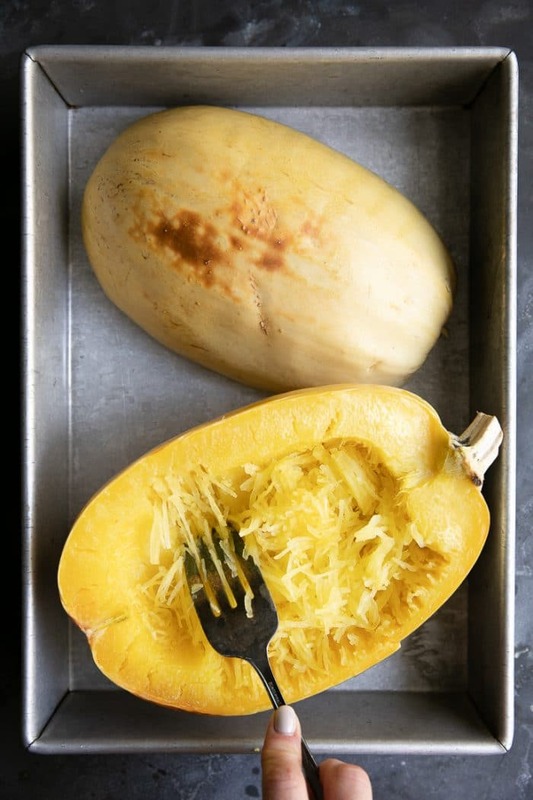 What you will need in order to get awesome and beautiful strands of spaghetti squash will depend on which method you choose to cook your squash. To keep things as easy as possible, I’m going to put everything you may need out there, simply note that if you plan to cook spaghetti squash in the oven, you will not need an Instant Pot or Slow Cooker. Fortunately, picking a good spaghetti squash isn’t hard. That said, here are a few tips on finding the best squash in the store. Look for one with a firm, dry rind that doesn’t have any soft spots and cracks. Choose a heavy squash. Not the biggest and therefore heaviest squash. Instead, feel for a squash that is heavy for its size. Dull is better than shiny. I know, I like shiny things, too, but in the case of spaghetti squash, dull skin is best. That said, the skin should be smooth without any wrinkling or soft spots. Like cooking, there are a few different ways to approach cutting spaghetti squash open. You may cut a squash open vertically or horizontally using a sharp and sturdy knife just the way you purchased it (aka raw). Or, you may cut small slits along where you plan to cut the spaghetti squash and microwave it for 5 minutes. How to cut spaghetti squash (raw)? Place the squash on a cutting board. Use a large, sharp knife to cut directly through to the center. Use this initial entry point as a guide to drive the knife through the spaghetti squash and continue by cutting around the entire squash. If the knife gets stuck, return to the starting point and rotate in the opposite direction. You may need to use your hands to pull the squash apart at the very end. Never try to cut through the stem. How to cut pre-microwaved spaghetti squash? 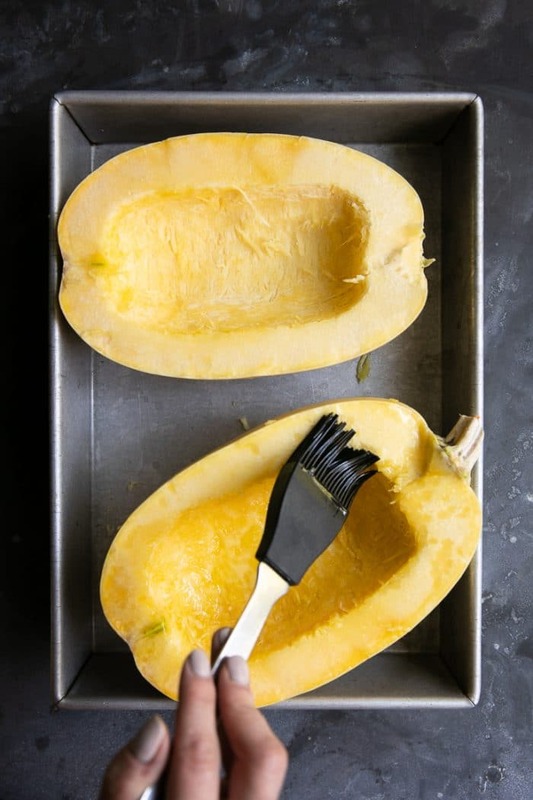 Use a paring knife to score the squash where you plan to cut it in half (think of it as a dotted line). Cuts should be 1/8- to 1/4-inch deep from stem to bottom on both sides. Poke the squash in several places using the paring knife. This will allow steam to release from the spaghetti squash. Microwave for 5 minutes in a microwave-safe baking dish. This will only cook the squash just enough to help make it easier to cut in half. Remove the squash from the microwave and place on a cutting board. Follow the same steps as you would for cutting a raw squash above. NEVER microwave a whole spaghetti squash for longer than 5 minutes as the pressure built up inside the squash from the steam could be very dangerous. When it comes to cutting any kind of squash, confidence is key. However, when in doubt, ask a friend 🙂 I’m on blood thinners (thank you stroke at 28-years-old), so whenever possible, I ask my husband to help. 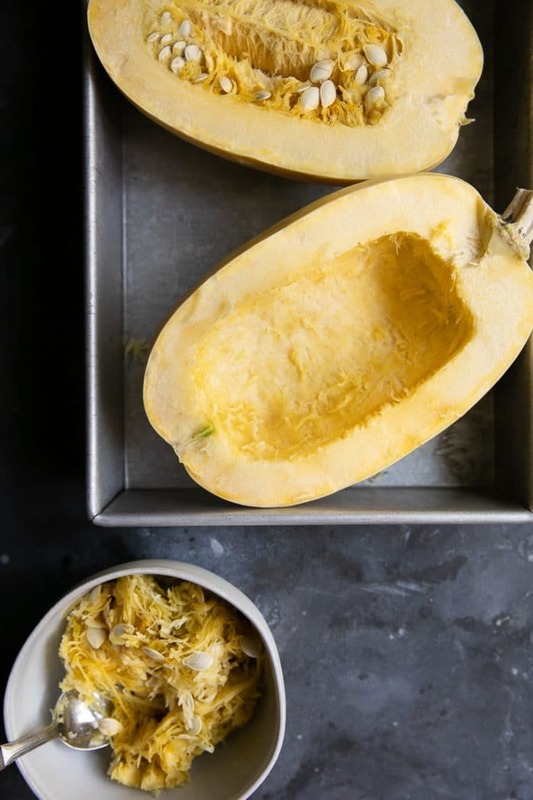 Can you eat the skin of Spaghetti Squash? Unlike the skin of acorn squash or kabocha squash, I would not recommend eating the skin of the spaghetti squash. Will it harm you, no. However, after the spaghetti squash has been cooked its skin turns rough- almost like egg shells- and is paper thin. And, unlike chips which are crunchy and easy to break up with your teeth, spaghetti squash skin is chewy and dense. Each method comes with their own set of pros and cons, so I recommend that you read through each before deciding which one you want to choose. 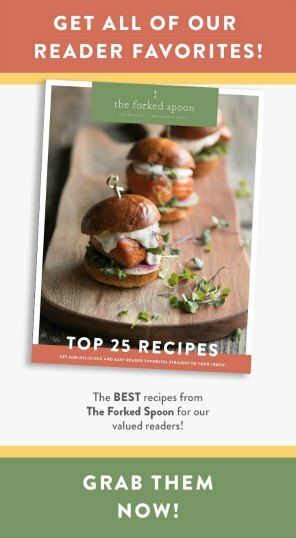 >> Ever wonder how to get the longest spaghetti squash strands? Rather than cutting your spaghetti squash in half lengthwise (vertically), cut it in half across the middle (horizontally)! The strands will be longer because strands run around the squash like strings wrapped around your finger. Slice your finger from one end to the other and you’re essentially cutting the strand in half. Roasting spaghetti squash in the oven is, by far, my favorite way to cook spaghetti squash. In my opinion, baking spaghetti squash produces squash with the best overall flavor and texture. The method is easy, doesn’t require any fancy equipment, and runs little risk of having a whole squash explode (this can happen if you forget to poke holes in a whole squash before cooking). It also makes delicious, beautiful strands of spaghetti squash with minimal residual water. Method 1- How to cook in the oven (cut in half). Cut the squash in half using a sharp, stable and reliable knife (read more about cutting squash above). You may either cut the squash in half lengthwise (stem to end- as shown in the images) or through the middle horizontally. Scrub the squash clean and dry thoroughly. Use a knife to cut small slits (approximately 15-20) all over the outside of the squash. This allows the squash to breathe and vent as it cooks. Since you will be cooking the squash whole, these slits allow hot steaming air to vent out, rather than build up (remember- air expands as it heats). Transfer to the prepared baking sheet and roast for approximately 45 minutes to one hour. Time will vary depending on the size of your squash. Rotate squash once during cooking. Remove from the oven, and allow to cool- it will be hot! Cut the squash in half, scoop out the seeds, and use a fork to separate the squash into strands. First, and most important, never microwave an entire whole spaghetti squash in the microwave for more than 5 minutes. And while I have never personally tested how much time it would take for a spaghetti squash to explode, I don’t think you should either. So, with that little bit of warning out in the open, let’s discuss why the microwave can come in handy. Basically, it’s fast, easy, and doesn’t take up an entire oven. This is awesome if you wanted to cook some squash and bake a cake at the same time. That said, microwaved spaghetti squash typically results in somewhat watery noodles and less flavor. Scrub the squash clean and dry thoroughly. Cut the squash in half using a sharp, stable and reliable knife. You may either cut the squash in half lengthwise (stem to end- as shown in the images) or through the middle horizontally. Scoop out the seeds. Drizzle the squash with olive oil and sprinkle with salt and pepper, if desired. Transfer one or both squash halves to a microwave-safe dish cute-side-down. Fill the dish with water so that the squash is partially submerged (approximately 1-inch should do). The exact water amount isn’t important- however, making sure the squash is microwaved in water is. Microwave on high for 5 minutes. Poke the squash to check doneness- the knife should go right through. If needed, microwave on high for an additional 2-5 minutes. Remove from the microwave and allow the squash to cool before using a fork to separate the strands. Depending which size Instant Pot you own will determine what size you can fit. I own a 6-quart Instant Pot which fits a 3-3.5 pound spaghetti squash perfectly. If you plan to cook a squash much larger, I recommend using a different method or using a larger Instant Pot. Scrub you spaghetti squash nice and clean. Dry thoroughly. Use a knife to cut small 1-inch cuts (approximately 15-20) all over the outside of the squash. These cuts are super important as they vent the spaghetti squash and prevent it from exploding. Place the steamer basket in the bottom of your Instant Pot and add one cup of water to the bottom of your pot. Place the squash directly on top of the steamer basket. Secure the lid of your instant pot. Set Instant Pot to manual mode and cook for 20 minutes on high pressure. After the 20 minutes is complete, quick release the pressure by switching the valve on the lid to “vent”. Allow squash to cool for approximately 15 minutes before cutting in half. 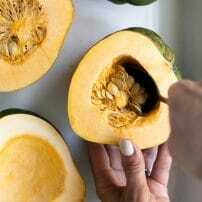 Once ready to handle, cut in half, scoop out the seeds, and use a fork to separate the strands from the squash. Transfer the squash to the slow cooker and cover with the lid. Cook on high for 4 hours, or low for 6-8 hours. Cooking time will vary depending on the size of your squash- periodically check for doneness by poking with a knife. Scrub and clean the squash. Fill a large pot 2/3 the way full with water and bring to a boil. Carefully add the whole spaghetti squash to the pot. It will float (that’s ok), but make sure that it has room to be fully submerged. Reduce heat to medium-low and cover the pot with a lid. Cook for approximately 30 minutes, rotating occasionally to ensure even cooking. When the squash is cooked, drain in a colander and allow to rest for at least 10-15 minutes before handling. Guys, the outside and the inside of the squash will be hot. Cut the squash in half, scoop out seeds, and use a fork to separate the strands from the squash. 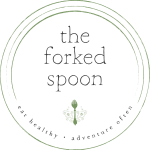 If you try cooking spaghetti squash using any one of these methods, please leave me a comment and let me know! I would also love to hear your favorite way to eat spaghetti squash- do you like it plain, with cheese, twice baked, covered in sauce? 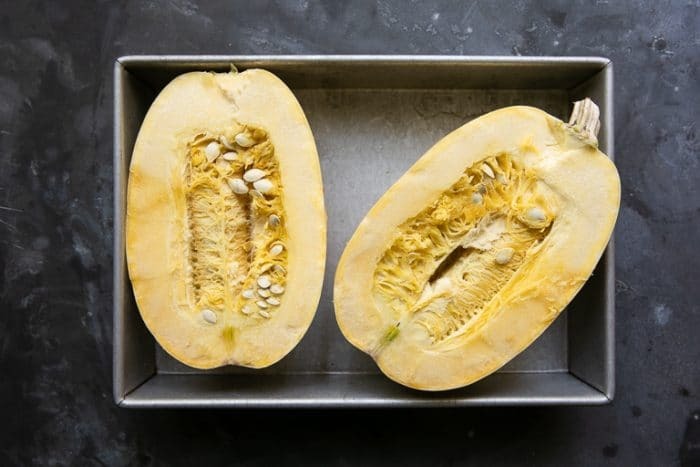 Learning How to Cook a Spaghetti Squash may seem intimidating at first, but once you learn these easy methods, tips, and tricks, you'll be a spaghetti squash expert in no time at all. In this post, I will share how to cut a spaghetti squash, how to pick a spaghetti squash, and how to cook this delicious squash in the oven, microwave, Instant Pot, and slow cooker. Scrub the squash clean and dry thoroughly. Use a knife to cut small holes (approximately 15-20) all over the outside of the squash. Transfer to the prepared baking sheet and roast for approximately 45 minutes to one hour, depending on the size of your squash, or until tender. Rotate squash once throughout cooking. Remove from the oven, and allow to cool. Cut the squash in half, scoop out the seeds, and use a fork to separate the squash into strands. Transfer one or both squash halves to a microwave-safe dish cute-side-down. Fill the dish with water so that the squash is partially submerged (approximately 1-inch should do). The exact water amount isn't important- however, making sure the squash is microwaved in water is. Scrub the squash clean and dry thoroughly. Use a knife to cut small 1-inch cuts (approximately 15-20) all over the outside of the squash. These cuts are super important as they vent the spaghetti squash and prevent it from exploding. Secure your instant pot and use the manual setting- 20 minutes, high pressure. After the 20 minutes is complete, quick release the pressure by switching the valve on the lid to "vent". 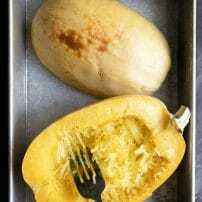 Allow squash to cool before cutting in half. Once ready to handle, cut in half, scoop out the seeds, and use a fork to separate the strands from the squash. Transfer the squash to the slow cooker and cover with the lid. Cook on high for 4 hours, or low for 6-8 hours. Cooking time will vary depending on the size of your squash- periodically check for doneness by poking with a knife. Fill a large pot 2/3 of the way full with water and bring to a boil. Carefully add the whole spaghetti squash to the pot. It will float (that's ok), but make sure that it has room to be fully submerged. Reduce heat to medium-low and cover. Cook for approximately 30 minutes, rotating occasionally to ensure even cooking. When the squash is cooked, drain in a colander and allow to rest for at least 10-15 minutes before handling. Nutrition information is for one whole cooked spaghetti squash with 2 tablespoons olive oil. Cooking times will vary depending on the method used and the size of the squash. Store leftover cooked spaghetti squash in an air-tight container for up to 5 days in the refrigerator. Hello, I cook my spaghetti squash all the time in the microwave. 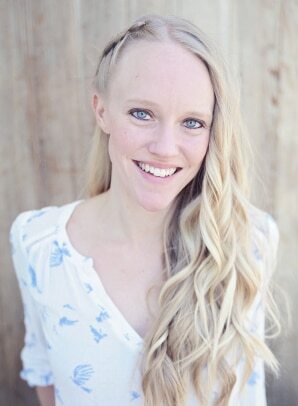 It is always perfect. Cut in half, scoop out seeds. Set on heat proof dish, cut side up. Salt and pepper. Cook on high for about 10 minutes, incovered. It is moist but not watery. Easy and fast.